Almost every life event calls for a celebration. That’s why it is important to relay your announcements through attractive design cards. Delight your guests with announcement card designs that are relevant to any of your occasions. You might be a newly wed couple announcing the arrival of your first baby or a friend who loves to spread the word of a married couple’s expectancy of a baby. Guests who attended a wedding announcement might also want to hear good news of your marriage. 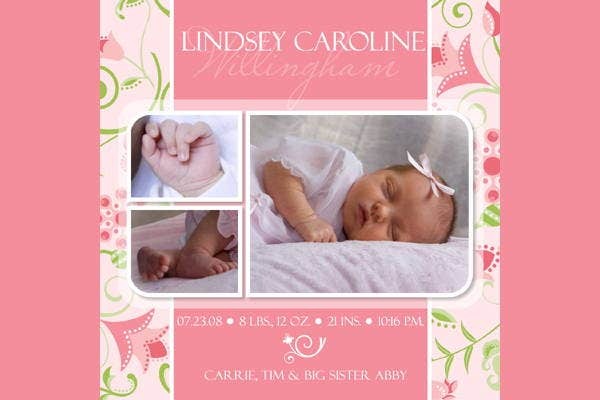 Thankfully, we have ready-to-customize baby birth announcement templates. 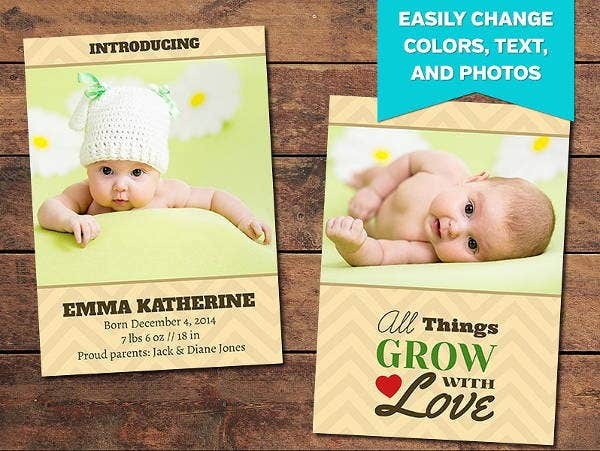 Our baby birth announcement templates come with seasonal designs, collages, and elegant frames that make your card stand out. Browse through our collection below and see which templates you prefer. 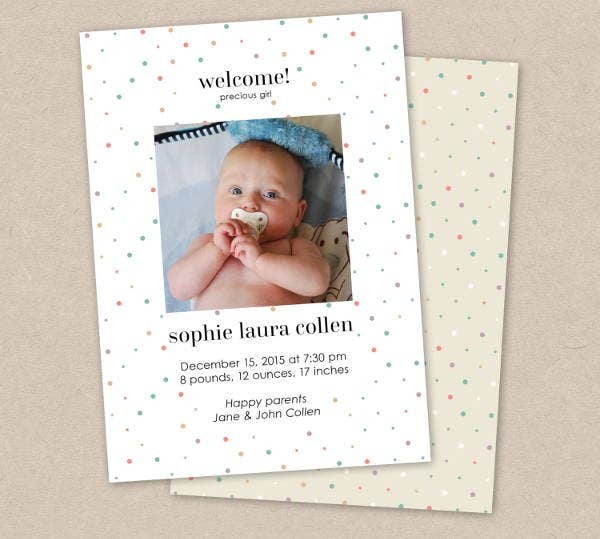 Birth announcement cards are similar to birthday invitations, only in a much cuter version. 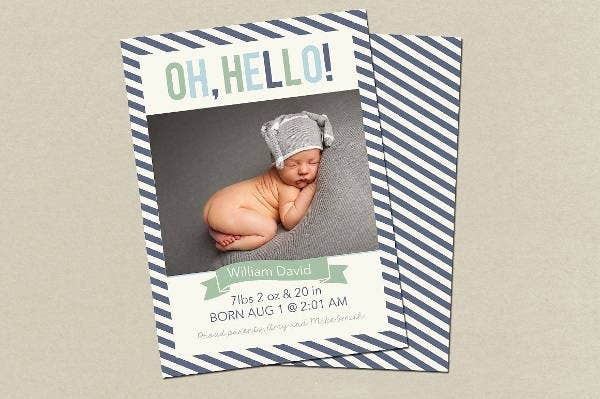 You can hand out birth announcement card templates even before the newborn baby’s arrival or hand them out right after the expected date so you can invite some friends over to celebrate your baby’s birth in your home. Seasonal Birth Announcement Template. 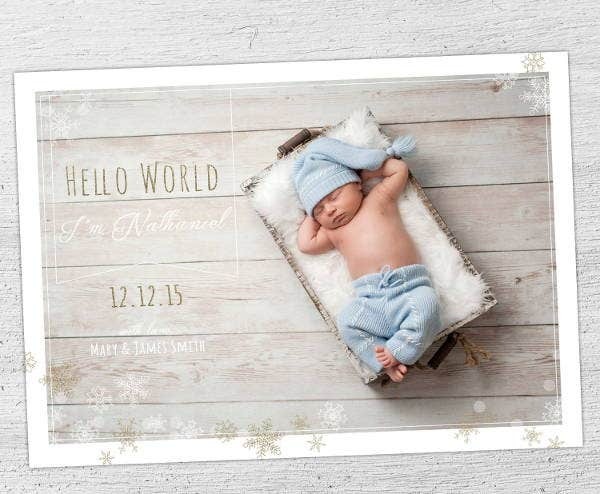 Needing a birth announcement template to match the holiday season? Choose the winter season design with a white border. Birth Announcement Template For Photographers. 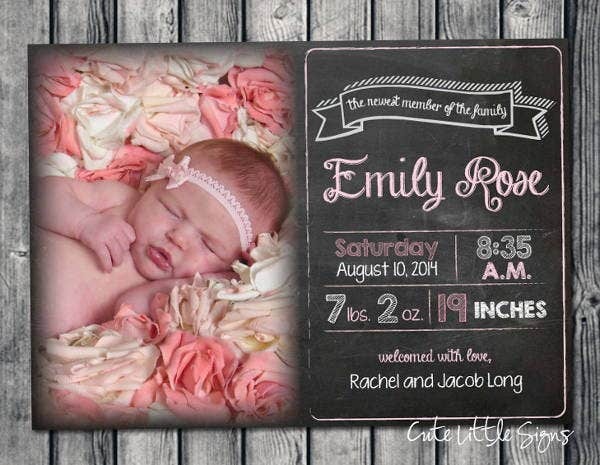 Need a baby birth announcement template for your photo studio? This card collage of a baby is perfect for you. DIY Birth Announcement Template. This polka-dotted design template is good for a quick DIY announcement card. Boy Birth Announcement Template. Need a baby boy design? Check out this striped birth announcement template. Chalkboard Birth Announcement Template. Need a kid-friendly design? You can use the chalkboard card template for inviting guests with children. Girl Birth Announcement Template. If you’re expecting a baby girl, the you need a feminine template such as this. 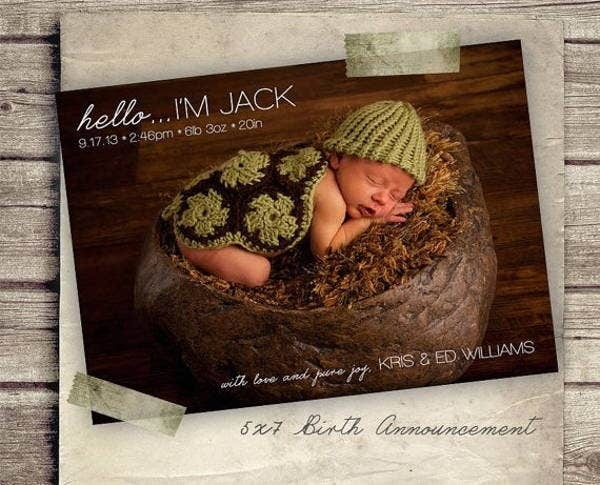 Photo Birth Announcement Template. Want a vintage card with landscape orientation? This wood-and-cream design will give a warm welcome to your guests. Printable Birth Announcement Template. If you want a warm toned card with a collage of photos and text to print out, then this template is for you. 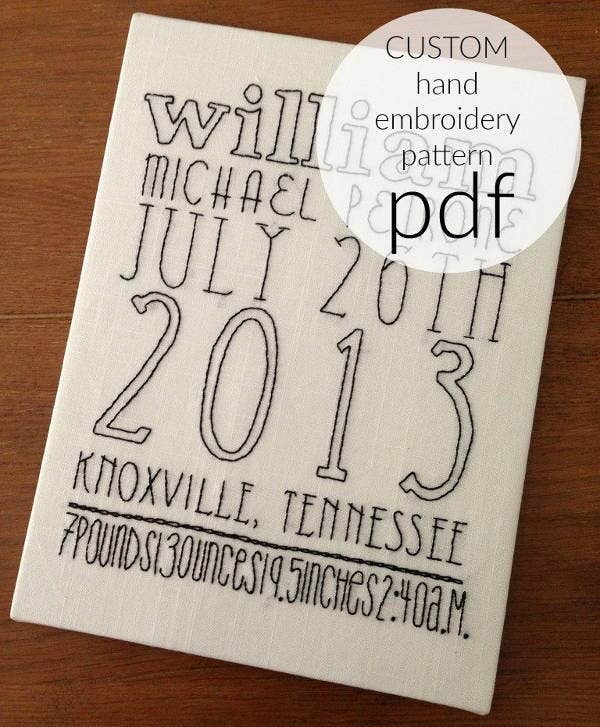 Embroidery Birth Announcement Template. Add a fabric design to your usual card with the embroidery birth announcement template. Gift Birth Announcement Template. Check out this cool and unique card that showcases your baby’s smile. Our baby birth announcement templates come in different layouts so you can be guided with the right text and images to place. Follow correct size of images. Our layouts contain square to rectangular images, so it’s a good idea for you to follow these sizes as indicated on Photoshop or your illustrator software of choice. Avoid moving spacing of text and elements. Moving text and other elements might distort the design, so it’s better to lock those layers after editing text. Check font style before changing text. Some font styles used in the templates might not be available in your Photoshop or Illustrator application, so you need to click the text tool and the text itself to see if there are any missing fonts you need to install. The fonts are readily available in a folder once you download the templates. Spread the word of how convenient it is to use our baby announcement templates by sharing our article through social media.